We know you are good photographers. Thanks to Instagram and other photo-enhancement apps, you may even think you're a GREAT photographer! Now is your chance to share your awesome talents with Hyphen readers across the country, and what better subject to focus on than the beloved fortune cookie? We want to see your best and most creative photos involving that sometimes cardboardy but always tasty folded treat! 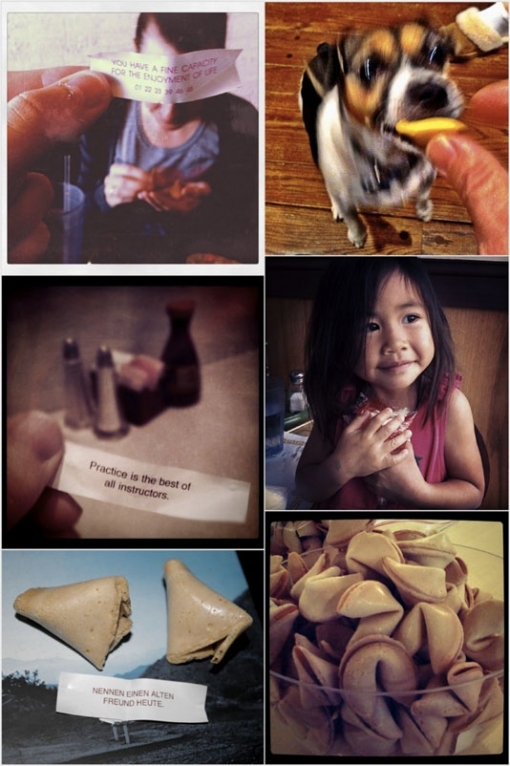 Upload your most creative fortune cookie photos with the hashtag #FortuneCookieUSA to Twitter or Flickr over the holiday season, and your works of art may be published in Hyphen magazine's 10th Anniversary Issue. * Deadline is January 12, 2012. Tease the dog! Fill an igloo, string a lei, arrange them with Christmas chiles, New Mexico style. Make a fortune cookie Periodic Table. Most importantly, seize the chance to be distracted from your relatives by taking your best fortune cookie shot and sharing it with your friends @Hyphenmagazine. Include your city and if you like, your real name. credit. We like fortune cookies -- we're not meanies. Photo credit from Flickr (clockwise from top left): Rudy Jahchan, glemak, Elton_Lin, niffyat, Dino Debris, pixelsrzen. Nina F. Ichikawa writes on food, agriculture and Asian American issues. She graduated U.C. Berkeley and Meiji Gakuin University in food policy, and her education also includes working as a restaurant dishwasher, making corsages at her family's 107-year-old flower shop and helping to establish the nation's first high school Asian American Studies program. She was a 2011-2013 Food and Community Fellow with the Institute for Agriculture and Trade Policy in Minneapolis, Minnesota. Twitters: @ninaeats.